I bought a pair of shoes last week, and the other day, I happened to look down while I was wearing them—without warning the most startling thought ran through my mind. It was as fleeting as passing towns on a long stretch of highway. I thought, “I wouldn’t have had the chance to wear these if I had ended it.” The realization caught me so off guard that I had to pause for a moment. The juxtaposition of new shoes and death almost made me chuckle. I didn’t understand how my mind could simultaneously have room for something as trivial as shoes and something as serious as suicide, and then lead them to collide into one jarring thought. But then words penned by Jamie Tworkowski popped into my head: Our hearts are heavy and light. Heavy and light. The perfect description for my heart and my head over the past eighteen months—and over the past twelve years. Depression is an elusive mixture of polar opposites. It feels like nothing and everything at the same time, unbearably painful but blissfully numbing. Every sense is sharpened and yet you feel duller as the moments tick by. You look down to find your knuckles are white, all the while you just want to let go. Depression is a part of me, I accepted that long ago, but its pull on me is something I still manage to underestimate from time to time. Just when I think I’ve mastered the game, I get a not-so-gentle shove reminding me of how deep its hooks extend. In the spring of last year it pushed me so hard, that I fell and didn’t get back up. For the first time, I thought I had seen my final days. For the first time, I doubted whether I would make it to tomorrow. And for the first time, I didn’t care. I have flashbacks of holding my phone, debating whether to call my best friend and have her drive me to the hospital. I remember the look of fear on my parents’ faces when they realized just how good of an actor I had become. But when I looked at my shoes, I realized how much I have left to do here. Too many things haven’t happened to me yet. The semicolon tattooed on my left wrist has too much blank space after it, and only I can fill it in. And so I stay. I stay because I am not the only one who has felt like this. I stay because I want to fall in love. I stay because there are countless nights ahead of my friends and I laughing until our sides ache. I stay because I haven’t danced at enough concerts. I stay because my family and I still have stories to write. I stay because my voice has thousands of songs left to sing. I stay because I need to feel the warmth of summer again and again. I stay because I don’t want life to move ahead without me. 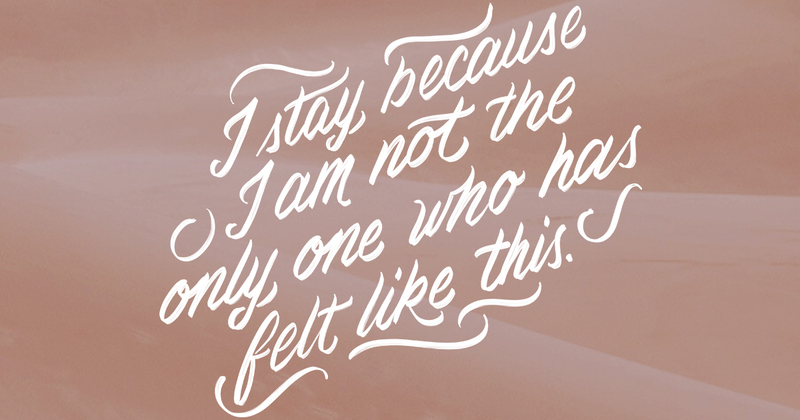 I stay because I am supposed to be here. And most of all, I stay for the reasons that I have yet to discover, knowing that I move closer to them with every breath. I have scars on my skin and on my soul. I am healing, but I am not healed; I am recovering, but have not recovered. I am a work in progress. Each day brings new challenges, but also small victories. Thank you. I will stay. Your words have kept me here. My best friend died to suicide. Do not debate wether to call your best friend (or whoever) for help. Do it. Do it for both you and her. Congratulations, you call it small victories, but I think you staying is the biggest victory, the first of many. Sharing this amazing post is just another victory. It really got to me and helped. Thanks, I hope you feel really proud. I have scars on my skin and on my soul. I am healing, but I am not healed; I am recovering, but have not recovered. That last part of this post hits so close to home. This whole blog hits close to home. TWLOHA has saved me multiple times, and then posts like this give me the push in the right direction that i needed at that moment. I needed this. Thank you for sharing and staying.